These two Sovereign Pontiffs were martyred for the Faith 120 years apart in the second and third centuries. 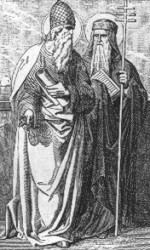 Pope Saint Soter was raised to the Papacy after the death of Pope St. Anicetus in 166. He was the 12th successor of Peter and it was he who forbade women to burn incense in the churches and also ratified matrimony as a sacrament, which could only be performed by a priest. He was martyred under Emperor Marcus Aurelius in 175. One hundred and eight years later Pope Saint Caius succeeded St. Eutychian as the 28th Pope in 283. Caius decreed that no one could become a bishop until he had passed through the orders from hostarius to reader to acolyte to exorcist to subdeacon, deacon and priest. For his sufferings under his uncle Diocletian he was made a martyr although he died a natural death on April 21, 296. Ancient Inscriptions bear testimony to the devotion of the faithful to these Pontiffs. Eternal Shepherd, do Thou look favorably upon Thy flock, which we beseech Thee to guard and keep for evermore through the blessed Soter and Caius Thy Martyrs and Supreme Pontiffs, whom Thou didst choose to be the chief shepherds of the whole Church. Through Jesus Christ our Lord, Who liveth and reigneth with Thee in the unity of the Holy Ghost, one God Forever and ever. R.Amen. Blessed be the God and Father of our Lord Jesus Christ! According to his great mercy, he has caused us to be born again to a living hope through the resurrection of Jesus Christ from the dead, to an inheritance that is imperishable, undefiled, and unfading, kept in heaven for you, who by God’s power are being guarded through faith for a salvation ready to be revealed in the last time. In this you rejoice, though now for a little while, if necessary, you have been grieved by various trials, so that the tested genuineness of your faith—more precious than gold that perishes though it is tested by fire—may be found to result in praise and glory and honour at the revelation of Jesus Christ. Alleluia, alleluia. V. Thy saints, Lord, shall blossom like the lily; shall be fragrant as balm in thy presence. Alleluia. V. Ps. 115:15 Dear in the Lord’s sight is the death of those who love him. Alleluia. I am the vine; you are the branches. Whoever abides in me and I in him, he it is that bears much fruit, for apart from me you can do nothing. If anyone does not abide in me he is thrown away like a branch and withers; and the branches are gathered, thrown into the fire, and burned. If you abide in me, and my words abide in you, ask whatever you wish, and it will be done for you. By this my Father is glorified, that you bear much fruit and so prove to be my disciples. As the Father has loved me, so have I loved you. Abide in my love. If you keep my commandments, you will abide in my love, just as I have kept my Father’s commandments and abide in his love. These things I have spoken to you, that my joy may be in you, and that your joy may be full. Just souls, be glad and rejoice in the Lord; true hearts, make your boast in him, alleluia, alleluia. In Thy loving kindness, we beseech Thee, O Lord, be moved by the offering of our gifts and enlighten Thy Church: that Thy flock may prosper everywhere and shepherds, under Thy guidance, may be rendered acceptable to Thee. Through our Lord Jesus Christ Thy Son our Lord, Who liveth and reigneth with Thee in the unity of the Holy Ghost, one God Forever and ever. R. Amen. Triumph. just souls, in the Lord, alleluia; true hearts, it is yours to praise him, alleluia. Since Thy Church has been nourished by the sacred repast, govern her in Thy clemency, we beseech Thee, O Lord, so that under the guidance of Thy mighty rule she may enjoy greater freedom and abiding integrity of religion. Through Our Lord Jesus Christ, Thy Son, Who liveth and reigneth with Thee in the unity of the Holy Ghost, one God For ever and ever. R. Amen.